If you’ve been hearing a lot aboutPinterest, it’s because it has caught on like a really catchy phrase…it almost seems as though it just came out of nowhere and now it’s breaking record speed for popularity, length of time on site (average? 90 mins+! ), and more. If you are a business owner, chances are you have not yet figured out howPinterest could be used in your marketing strategy. Sure, you have established goals for each of your individual marketing tactics, like your content marketing. You have even created a step by step plan to achieve those goals, possibly with the incorporation of social media (why not, everyone else is). But I bet you didn’t think that posting pictures could be much of a marketing boost, right? Pinterest is boasting faster growth numbers than some of the more popular social networks when they first started out – i.e. Twitter, Facebook, etc. At my last reading, they had nearly 12 million monthly unique visitors and it hasn’t even in existence very long. Creating a Pinterest profile could very well help you be exposed to new leads, drive traffic and boost your business growth. Pinterest is actually catching on so fast, I suspect, because it’s heralding the next social media phase – visual imagery. Remember when it was all about written content? Then we heard video? Pictures and visual imagery are hot right now because they speak to people emotionally. Visual aspects of how you market are becoming more and more important. And it would be very smart to develop an image sharing strategy to tell your story, to convey your branding, to make faster connections. Blog plugins are one of the easiest ways to integrate Pinterest into your existing marketing tactics and strategy. 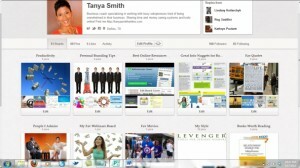 There are several Pinterest plugins and more are being added as the site continues to grow and develop. In addition to “Pin This” and “Follow” buttons on your blog you can add plugins that allows you to share your most recent pins. This could be a way to motivate visitors to pin your images and also follow you on Pinterest. Consider taking a look at your existing content marketing plan. Evaluate how you can add more visual interest to your blog or website. For example, can you add more images to your blog posts? Can you convert some of your content into short videos? You can pin videos on Pinterest. Do any topics lend themselves to infographics that you can share on Pinterest? Pinterest is intimately connected with Facebook and Twitter. In fact, if you don’t have a Facebook or Twitter account you can’t get a Pinterest account. And you can post any pin onto your Facebook or Twitter profile. 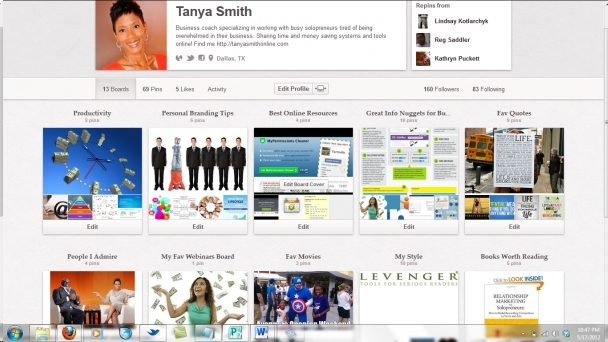 You can also add buttons to your Pinterest profile so Pinterest followers can find you on Facebook or Twitter. Take a look at your existing Facebook and/or Twitter marketing tactics. How can you enhance them with Pinterest? Remember to test and track your efforts. Add Pinterest to your analytics. Pay attention to who is pinning your content and repinning your pins. Track your Pinterest traffic and integrate your efforts with other traffic generation strategies you’re using. By the way, you have to be invited in order to set up an account. If you need an invite, simply visit me on Facebook and let me know you need an invitation. You’ll be able to view my Pinterest tab there also (remember? integration ). Tanya Smith is a creative business strategist and coach specializing in showing service based solo entrepreneurs how to simplify, save time & stand out with simple strategies that engage more quality leads and clients. Her company Be Promotable provides fresh actionable strategies and virtual resources to promote business owners as power players in their market. For instant access to your free 7 secrets to online time management report, visit us at: www.tanyasmithonline.com. Previous articleProduct Review: Calendula Sugar Cane Exfoliate by Julia J. Next articleI AM Who God Says I AM! Next: I AM Who God Says I AM!